EntityCube is a research prototype for exploring object-level search technologies, which automatically summarizes the Web for entities (such as people, locations and organizations) with a modest web presence. The Chinese-language version is called Renlifang. The need for collecting and understanding Web information about a real-world entity (such as a person or a product) is mostly collated manually through search engines. However, information about a single entity might appear in thousands of Web pages. Even if a search engine could find all the relevant Web pages about an entity, the user would need to sift through all these pages to get a complete view of the entity. 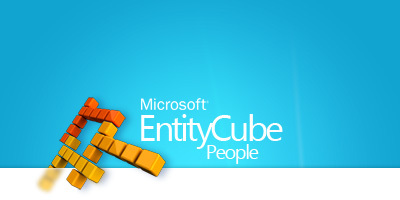 EntityCube generates summaries of Web entities from billions of public Web pages that contain information about people, locations, and organizations, and allows for exploration of their relationships. For example, users can use EntityCube to find an automatically generated biography page and social-network graph for a person, and use it to discover a relationship path between two people. Renlifang (http://Renlifang.msra.cn) is the Chinese version of EntityCube (and the name EntityCube is the English translation of Renlifang) which currently has millions of daily page-views during the peak days.